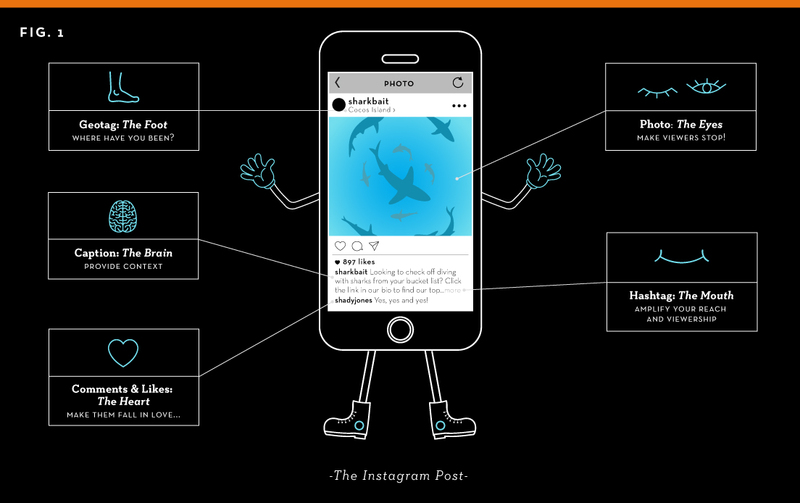 Have you ever wondered how the different parts of an Instagram post function? Look no further; the M studio social media team has created an easy-to-follow diagram which breaks-up the working parts of this image-driven social media platform. Understanding the functionality of Instagram allows users to create the most optimal and engaging content to connect with their target audience. Posting photos that are engaging and of hi-quality will help to grab the attention of your brand’s audience when they are scrolling – hopefully, your image will cause the audience to STOP the scroll. Does the photo meet Instagram’s sizing guidelines? Is the photo of hi-quality? Is it clear? Is it pixelated? Is the image visually appealing? Does the photo take the Rule of Thirds and Composition into account? Is the image relevant to what your audience is interested in? What are you trying to showcase? Is the image aligned with your brand style or story? The caption portion of an Instagram post provides a place where meaning is given to a photo. This area is also a trigger section for engagement – so make sure to include a call-to-action or persuasive words whenever possible. SIDE NOTE: Front-load your captions with valuable content or calls-to-action, and leave any hashtags, @mentions, or extraneous information for the end. The caption of a post should echo a brand’s overarching voice. Engaging with audience members creates brand loyalty! Responding to questions or comments (good or bad) demonstrates you, the brand, care about your audience. Brand loyalty is of the utmost importance as a business in today’s digital landscape. So whether a comment or question is positive or negative, make sure to respond as quickly as possible. If you don’t have time to type out a response to every comment a post receives, at the very least, utilize Instagram’s “heart “” option for comments: tapping the “❤” provides at least a minimal level of engagement with audience members that take the time to comment. Amplify the reach and viewership of an Instagram post when you utilize hashtags. Use specific and relevant hashtags to help connect and reach your target audience or people who are looking for exactly what you’re posting about. Anyone who does a search for that hashtag may find your Instagram post. Some Instagram users include a string of searchable hashtags as a way to get more followers, but the fact is, it looks spammy to the followers you do have. Limit your hashtags to three or four, tops, or hide them. Geo-tagging your Instagram posts displays the desired location of each image. People can click on geotagged locations and see all of the posts that also utilized that location’s geo-tag. This is a great way for a new audience to easily find you by location. As with most social media platforms, Instagram is continuously changing. Luckily, we are here to help. Sign-up here to stay up-to-date on the ever-evolving anatomy of Instagram.